Design the perfect home court with basketball flooring to fit any budget. 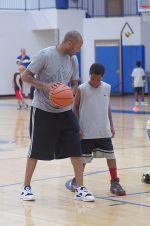 Before you buy basketball sport court equipment, here are some important questions for you to consider. The basketball, the goal, and the court surface. If you have a problem with any one of these, your game won't be up to par, and you won't have the best playing experience. 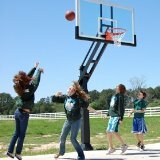 Basketballs come in all sizes and colors and materials. You need to select the right basketball size for your age with the outer covering appropriate for the location of your basketball court. It can either be a portable basketball hoop or an in ground basketball system, but it needs to be level and stable. You need a surface that is level, has good traction, and allows the ball to bounce evenly. There are different types of floors for indoors and out. Do you remember that scene in the movie, Hoosiers, where the guy is shooting around on a dirt basketball court out on his farm? There's a good reason why basketball is not played best on a dirt surface. It just doesn't work that well. Fortunately, there are some great options available when you're ready to buy basketball flooring that will fit most budgets. In fact, there are so many choices you may find it hard to decide. How will the court be used? Will it be strictly used to play basketball or do you want a multi-sport court that can be used for all types of games? For a large family, a multi-sport makes a lot of sense. The range of money you can spend is pretty broad depending on how simple or extravagant of a court you want. Your budget will also impact the basketball court size you end up with. How much room do you have to work with? Do you want a full-size court or something much smaller? A couple years ago, I was looking to install a backyard basketball court. I knew what I wanted, but when it came to actually trying to fit the basketball court dimensions into my yard, I sadly realized I didn't have the amount of space I needed. So, I had to trash the idea and stick with my driveway basketball court. This is a huge factor to me. All surfaces respond differently when your body runs and jumps on it. I can tell when I've been playing on concrete for long periods of time because my lower back and knees really take the brunt and really start to ache. When I play on a court with more "give" my body joints don't get as sore. You'll also find different surfaces absorb heat more than others. If you live in an area with extremely high temperatures, your feet will really feel the heat radiated from courts like asphalt and concrete. Where will the court be located? More specifically, will it be an indoor or outdoor court? Will it be frequently used by a lot of people or will only a few people play on it occasionally? How much time, money, and energy do you want to spend on maintenance and upkeep? Different surfaces require different levels of care. Do you plan to install your basketball flooring yourself or will you hire a professional? How long do you expect your flooring to last? Because each type of flooring is constructed with different materials, they have different levels of durability. The sky's the limit on this one! With some of the portable sport court options available today you can create your own unique basketball court layout and design. This is another biggie, and it really depends on the ages of the players who will be using the court. If you've got little kids or older folks who will spend a lot of time on it, concrete or asphalt may not be the best option. I've seen people take pretty rough falls on both of those surfaces, myself included, and you can wreck yourself pretty good. 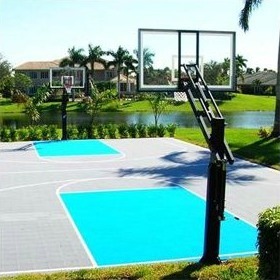 If you're building an outdoor basketball court, you definitely need to consider the weather conditions where you live. Do you live in a part of the country that experiences extremes, either extreme hot or cold? You want to make sure the type of basketball flooring you choose can withstand the temperatures and climates it will be exposed to. Now, let's take a look at the types of basketball flooring available.